Remember the first car you bought? You picked it out......all the bells and whistles! First brand new car.....right off the lot! Katie and I made the first purchase in October 2004. Almost 15 years later, I think we can safely say that we got our money out of that Chevy. They estimate the moon is about 238,900 miles from Earth so we came within 45,000 miles of making it there in that old truck. Over the years the car has had its fair share of issues and I knew that the days of not having a car payment wouldn't last. We really got the most out of that car - I was able to work on it myself (for the most part) but i knew that I would eventually end up donating it or scrapping it. What I didn't realize about that old SUV was how hard it would be to let it go. I mean who doesn't want a 2004 SUV with 192,000 miles, heat/ac vents that only work in certain modes, rear speakers that don't function, and a transmission that is shot? I am sure CarMax gets a ton of folks looking for just that. A few weeks back I drove the old SUV on a road trip with some of my oldest friends. It was a great trip (minus the tow bill) with some of the best friends in the world. On the way back home - the old SUV gave out. It would need transmission #2. As I rode in the tow truck back home it dawned on me what this car has meant to our family. Katie and I bought this car knowing that we were starting a family. This was the car that carried Andrew, Nathan, and Kaylee home from the hospital. This car had taken us to so many great places and held so many memories of our family. I can remember having some really great conversations with Drew and Nate when they were young as they rode in the back of that SUV. I remember when we had to ride with the windows down for a few days because I allowed some gasoline to spill in the second row floor and that is a smell that will last for awhile - maybe also the reason that Nate once wrote on his preschool assignment that he loved the smell of "gas." I remember Nate and I taking trips to Home Depot in that truck. I remember Nate and I putting the groundhogs we caught in our traps into the back of that SUV and driving down to a good spot to drop them off - Nate in the back and the ground in a cage in the far back......I remember hearing that groundhog make noises and thinking to myself "if that thing gets out of that cage in this SUV - it is going to be pandemonium!" There are a ton of memories in that old car. I guess the reason that the old SUV is really so meaningful is one memory in particular....Labor day weekend 2012. I'm not sure why we decided to take that SUV instead of the newer one - maybe because it was a bit bigger and gave us a bit more room. We had packed up the kids, dogs, bags, toys, fishing poles and we headed out. The boys had started school that week and we had headed out to surprise them. That was the Thursday before Labor Day. Nathan died three days later - September 2, 2012. 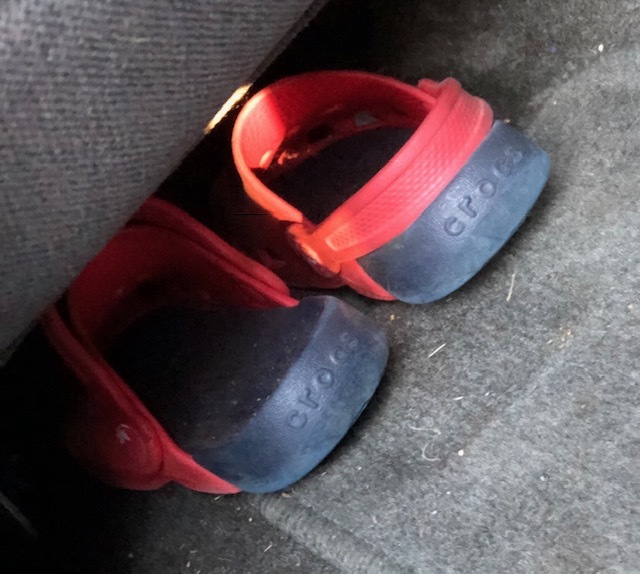 I remember packing up the truck to come home from the lake that weekend, I found Nathan's red/blue Crocs that he wore all the time tucked up under the rear of the driver's seat - I lost it..........full out lost it in the driveway. He had worn those shoes on the ride down and had fallen asleep just miles from the house. I probably carried him int the house and left his shoes in the car. Little things that had contact with someone that you have lost can take on a whole new meaning once they are gone. Those red/blue Crocs meant something to me after that weekend. In the 6+ years since - they have remained under the driver's seat of that old Chevy, tucked up under there where you would almost miss them unless you bent down to look. I see them there all the time and just never felt a want to take them out. It was almost like Nathan was riding with me with those Crocs under the seat.I remember coming home from the lake that weekend, my brother drove us the 4.5 hours back in that old Chevrolet. Jason and I sat up front while Katie rode in the back with her babies. It was a quiet ride - nothing that could have been said would have helped and there was just a feeling of "What do you say? What can you say? What words would I be able to say that would change this reality or make this any better?" I remember typing much of what would become Nathan's eulogy on my phone as we drove.......random thoughts about his life and how it changed mine. Thinking about Nathan and his short life. Thinking about what just happened to our lives. Could we recover from this life altering event? Would we ever be able to feel joy again? How unfair it was that this had happened.....how unfair that others have had to go through this before and that others will go through it after. It took a long time, family, friends, and each other before we forced ourselves to allow happiness back into our hearts - you have to let yourself know that its okay to be happy again! Its okay to feel joy. I'm honest enough to admit that its hard and I have good days and bad days.......that's okay too. It is a feeling I remember, one that I hope others won't ever have to experience - the emptiness of going someplace with your children and returning home without one of them. Katie and I returned home from the weekend and fell to the floor in Drew & Nate's bedroom. We cried for a good long time that day in that room - I guess it made us feel closer to him being in his room. That return to our home, our safe place, without Nathan was so hard. It was a something that I won't forget but try not to live in for too long. I try to not replay that weekend in my mind......I will talk to others about what happened but I don't spend much time on it in my own mind. It won't change it, it won't heal what is broken, it won't alter the remainder of our time here on earth and it certainly won't bring Nathan back. Barbara Taylor Bradford wrote "The past was always there, lived inside of you, and it helped make you who you were. But it had to be placed in perspective. The past could not dominate the future." I feel that way about Nathan and what happened that weekend - he is always right there with us, the emotions of losing him are constantly right at the surface. It is a wave that crashes onto the beach. The waves will always come towards the beach, but the severity of each wave differs. Depending on the storm(s) that surround us - depends on the severity of the waves. No matter the storm - we must anchor our feet in the sand and stand firm against the tide, never allowing the waves to dominate us.